Getting ready for summer beach-wear doesn't need to be work, it can be a vacation too. NEW YORK (TheStreet) -- By the onset of spring, most weight-loss resolutions have long since failed. But with less than 100 days left until summer, there's still time to attain that summer swimsuit body with the assistance of a destination spa that often comes with resort-like luxury and price tags on par with a seven-day cruise. So if you're eating like it's November in spite of the arrival of spring, here are some lavish spa getaways that take the bite out of detox. By April the Caribbean has cooled of its paparazzi sizzle as island destinations like Anguilla, Turks and Caicos return to normalcy. It's in the latter that you'll find the glamorous Parrot Cay, a private destination island by the owners of London's Metropolitan and The Halkin. The property is home to an outpost of their COMO Shambhala Retreat that is a magnet for upper-crust and celebrity clients. Getting your body in shape for summer doesn't have to be work, it can be a vacation instead. Often via private speedboat transfer, Parrot Cay guests arrive to a stylish oasis where they can pick and choose a hotel stay with various a la carte spa treatments. Multi-day stays can be coupled with meditation and yoga sessions to more intense wellness paths that match multiple treatment regimens spaced out over an entire stay. Those looking for a more comprehensive stay can participate in organized programs like the upcoming Curry Sisters Retreat in late April. The retreat offers a structured six-night trip with daily yoga classes, instructed meditation and all-inclusive COMO Shambhala cuisine priced from $7,645 (based on double occupancy). Those looking for more detox than a hot yoga room can make the trek to the land of Von Trapp and Austria's acclaimed Viva Centre for Modern Mayr Medicine. The clinic was named after famous Austrian physician Dr. Franz Xaver Mayr, who believed much of human illness and sickness is born directly from the digestive track. Today, visitors to the clinic check-in for thorough medical examinations with the purpose of creating individual treatment plans that extend over an entire stay. Treatments at Viva Mayr include applied kinesiology, electrolysis baths and Kneipp treatments that improve and regulate blood circulation inside a futuristic contraption. With an emphasis "on rest, strict cleansing of the digestive system and re-education of eating habits," visitors should expect a restricted diet and occasional shot of cultured milk. For those expecting hospital-style guest rooms, the on-site Viva Hotel surprises with a sparse Scandinavian aesthetic that swaps the customary mini-bar out for in-room organic cuisine by staff nutritionists and zero-calorie views of spectacular Lake Wörth. Fewer doctors and more soul searching can be found at Mii amo in Sedona's Boynton Canyon where this spa bases many of its treatments on Native American practices and beliefs. One of the easier hotel-based programs to navigate prior to arrival, Mii amo offers three- to seven-night journeys that allow guests to personalize the goals of their stay -- whether they be spiritual, stress relief or substantial weight loss. Mii amo staff conducts a thorough evaluation of each guest on arrival and takes into account previous dietary habits, exercise routine and future goals to determine treatments that can range from classes on compassionate communication, past life regression, strength training or astrology with crystals. Rates are surprisingly reasonable for a resort of this caliber, especially for solo-travelers. Single-occupancy packages start from $2,670 for a three-night stay and includes three meals daily and most classes and spa services. Those looking for a mild nip and tuck can check in at the Montage Beverly Hills, which has a posh address and colonial Spanish luxury that is home to an outpost of Scarpetta and nearby Bouchon Bistro by Thomas Keller. Once the foodie temptation is survived, grandeur on a movie star level is found at Spa Montage with its two-story atrium offering mineral pools, 12 massage suites and five wet treatment rooms. 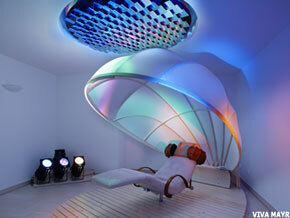 Therapies are inspired by water, earth, orchard and touch with additional pre-natal and fitness packages. For those that need just a bit more bang, the Montage Beverly Hills is conveniently cattycorner to Beverly Hills Plastic Surgery, which specializes in convenient outpatient treatments from Botox and Dysport to Restylane and Radiesse. With a full-service plastic surgeon administering most treatments, the location that was once an E-Trade storefront now offers another type of investment for those looking for perpetual youth. Further than all of them, Split Apple takes reinvention seriously from its otherworldly perch above New Zealand's Abel Tasman National Park. An architectural compound with a jetting infinity pool, minimalist interiors and white-glove service seems an unlikely health retreat. But don't be fooled, the property is owned by retired doctor Lee Nelson and his wife Pen, who incorporates philosophies of health and sustainability into her gourmet cooking that looks to change lives. Split Apple has wellness packages from two to seven days that offer a mix of adventurous hikes through nearby national parks, nutrition and longevity consultations all mixed with meditation and massage sessions. The owners attempt to send guests off with a more contemplative health regimen from new cooking techniques to lifestyle and exercise transformations that hopefully continue long past the summer bikini season.